Two NASA astronauts ventured outside the International Space Station to perform the sixth spacewalk of 2018 at the orbiting complex. The nearly seven-hour long outing saw the duo install new cameras in preparation for upcoming commercial crew flights. Expedition 56 astronauts Drew Feustel and Ricky Arnold have both now been on three spacewalks together since they arrived in March. 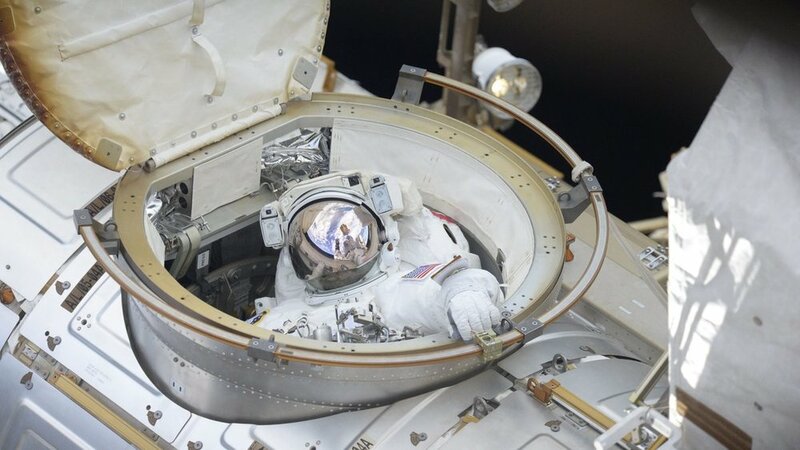 The primary task for this particular extravehicular activity, according to NASA, was to install high-definition cameras to provide enhanced views during the docking of commercial crew spacecraft, the first of which could launch later this year. Other tasks included the swapping of a camera assembly on the starboard truss and to close an aperture door on an external experiment on the exposed facility on the Japanese Kibo module. After depressurizing the Quest airlock, Feustel and Arnold switched their suits to battery power, officially starting U.S. EVA-51 at 8:06 a.m. EDT (12:06 GMT) June 14, 2018. Arnold was in the suit with red striped, designated extravehicular crew member 1, or EV1, while Feustel was in the suit with no stripes and designated EV2. To add the HD cameras required Feustel and Arnold to work together to run power cables across the Destiny laboratory’s exterior and across the Harmony module to the forward section of the node. After that, the two each installed a boom with an HD camera attached. The two camera booms required power and data cables to be connected. With the first primary task completed, the two began work replacing an HD camera on the starboard truss. Much like previous spacewalks performing this task. It required the installation of a foot restaurant on the robotic Canadarm2 so that Arnold could ride it to the work area just below the S1 truss. Arnold replaced an external light as well as the HD camera before getting off the arm and cleaning his work space. Feustel, meanwhile, took a foot restraint and made his way to the exposed facility on the Kibo module to begin work to close an aperture on an experiment that is set to be removed and disposed of on a future Dragon cargo spacecraft flight. The Cloud-Aerosol Transport experiment, which was designed to fire a laser to study Earth’s atmosphere, failed. This meant that it could not close its aperture door. In order to safely remove it, the door had to be manually closed by Fuestel and wire-tired shut. Once the primary goals were completed, the two were able to complete to additional tasks. The astronauts relocated a grapple bar for future spacewalkers and secured gear associated with a spare cooling unit, according to NASA. U.S. EVA-51 concluded when the hatch was closed and the re-pressurization process started. That occurred at 2:55 p.m. EDT (18:55 GMT)—a total duration of 6 hours, 49 minutes. Overall, this was Arnold’s fifth spacewalk with 32 hours, 4 minutes spent outside. Feustel, however, was on his ninth EVA. His 61 hours, 48 minutes spent in the vacuum of space places him third in list of cumulative spacewalking time, passing NASA’s Peggy Whitson’s 60 hours, 21 minutes. For comparison, retired NASA astronaut Mike Lopez-Alegria is in second place with 67 hours, 40 minutes. In first place is retired Russian cosmonaut Anatoly Solovyev. His 16 spacewalks net him 78 hours, 21 minutes to make him history’s most experienced spacewalker. U.S. EVA-51 was the 211th spacewalk in support of ISS assembly and maintenance. According to NASA, astronauts and cosmonauts have now spent 54 days, 23 hours, 28 minutes working outside the ISS since assembly began in 1998.